ELISA tests are used for the detection of serum or oral fluid antibodies. It is easy, rapid and cheaper compared to other assays. 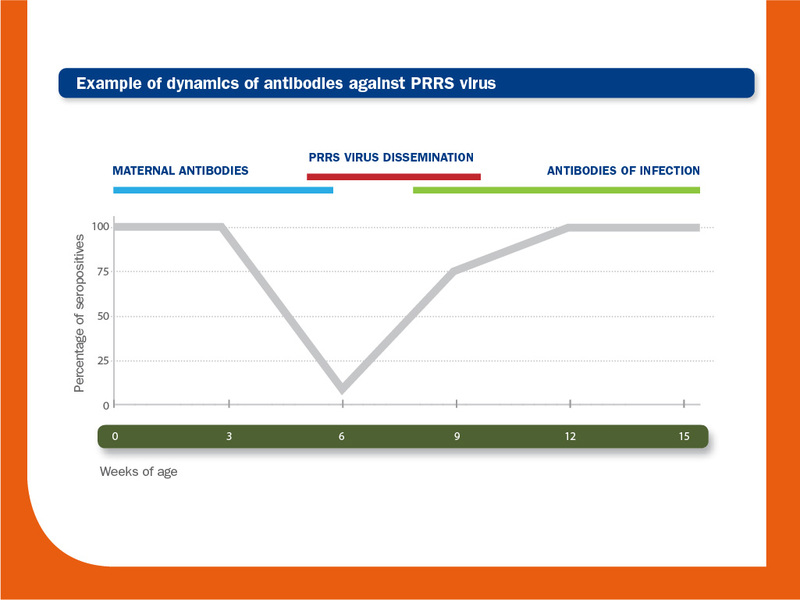 At present, there are many commercially available ELISA kits for detection of PRRS virus-specific antibodies; some of them have the ability to identify antibodies against both PRRSV1 and PRRSV2; others can distinguish the species. Recently, some ELISAs have been also adapted to testing oral fluid samples. Seroconversion (meaning becoming positive to antibody tests) indicates that an animal has been infected by PRRS virus or alternatively, that it has been vaccinated. However, individual responses are variable and some problems of sensitivity and specificity could exist at this level. Thus, major discrepancies between different commercial ELISAs have been observed when classifying individual pigs; this problem may be solved by testing the same sample with more than two tests. Nevertheless, ELISA is one of the most common assays used to detect and monitor infections on a herd basis. Series of samples from various ages are useful to determine the age of infection and the duration of maternal antibodies, which are usually detected till until 3-8 weeks of age. Immunoglobulin M is detected within 7 days, whereas Immunoglobulin G is detected within two weeks. If an ELISA assay is based on detecting antibodies against N protein, positive results are usually obtained at 14 days, while a maximum peak is usually observed at 5-6 weeks post-infection and can be detected during several months. Some pigs may become seronegative within 3–6 months, but others remain seropositive for much longer, until 1.5 years yet; there is a strong idiosyncratic component. At present, commercial ELISAs cannot distinguish infected from vaccinated animals. ELISA should not be used to estimate the stage of the infection. Antibodies detected by commercial ELISAs do not correlate with protection. High antibody levels detected by ELISA are not necessarily related to high virulence. Usually, results are shown as a ratio (S/P ratio) between the sample and a positive control provided by the manufacturer. Therefore, ELISA result cannot be considered as a “titer”. The magnitude of S/P ratio cannot be used to differentiate vaccine-derived antibodies from field isolate-derived antibodies. In a revaccinated animal or after an infection in a previously infected/vaccinated animal, an increase in antibody levels cannot always be observed. Both assays are based on indirect staining of pre-prepared monolayers of infected cells. Briefly, MARC-145 cells or porcine alveolar macrophages are seeded and infected with PRRS virus in microtitre plates. Later, the serum to be tested is added. If antibodies are present in the serum, they will bind to the antigen in the cytoplasm of the infected cells. In the case of IPMA, the bound antibodies are detected by anti-species horseradish peroxidase conjugate and a chromogen. The result is read using an inverted microscope. IFA is similar to IPMA, but in this case the bound antibodies are detected using an anti-porcine-IgG conjugated to fluorescein. The result is read using a fluorescence microscope. In both cases, sensitivity could depend on expertise of the laboratory and on antigenic differences between the isolate used in the test and the field virus that induced the antibodies. Using serial dilutions of the sample, the titer of antibodies can be quantified. 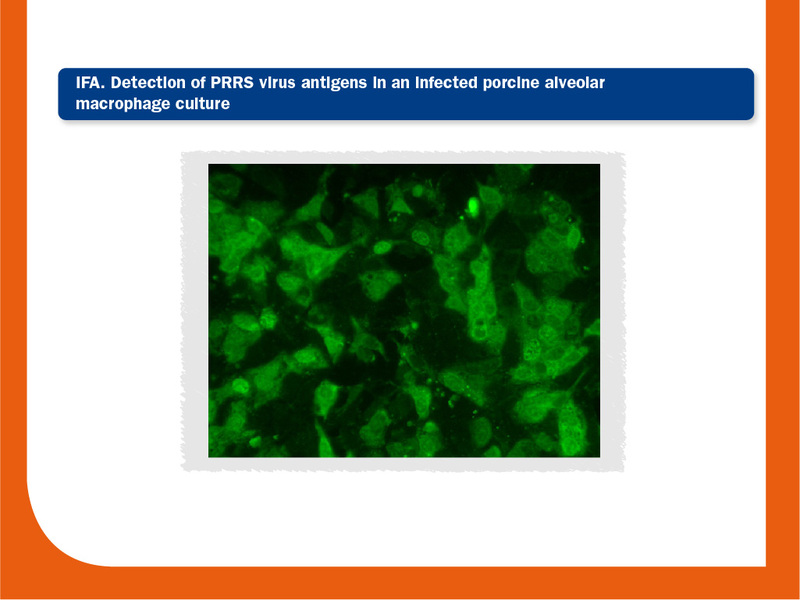 It detects antibodies capable of neutralising PRRS virus in cell cultures. Neutralising antibodies develop slowly and do not reach high titres. The sensitivity of VNT strongly depends on antigenic differences between the isolate used in the test and the field virus that induced the antibodies. It is not a routine diagnostic test. Using serial dilutions of the sample, the titer of neutralizing antibodies can be measured.